Optical molecular imaging, a highly sensitive and noninvasive technique which is simple to operate, inexpensive, and has the real-time capability, is increasingly being used in the diagnosis and treatment of carcinomas. The near-infrared fluorescence dye indocyanine green (ICG) is widely used in optical imaging for the dynamic detection of sentinel lymph nodes (SLNs) in real time improving the detection rate and accuracy. ICG has the advantages of low scattering in tissue absorbance, low auto-fluorescence, and high signal-to-background ratio. The detection rate of axillary sentinel lymph nodes biopsy (SLNB) in breast cancers with ICG was more than 95 %, the false-negative rate was lower than 10 %, and the average detected number ranged from 1.75 to 3.8. The combined use of ICG with nuclein or blue dye resulted in a lower false-negative rate. ICG is also being used for the sentinel node detection in other malignant cancers such as head and neck, gastrointestinal, and gynecological carcinomas. In this article, we provide an overview of numerous studies that used the near-infrared fluorescence imaging to detect the sentinel lymph nodes in breast carcinoma and other malignant cancers. It is expected that with improvements in the optical imaging systems together with the use of a combination of multiple dyes and verification in large clinical trials, optical molecular imaging will become an essential tool for SLN detection and image-guided precise resection. Huan-Cheng Zeng and Jia-Lin Hu contributed equally to this work. According to the WHO global cancer report in 2014, the global cancer incidence and mortality were about 14 million and 8 million, respectively . Despite significant technological advances and a better understanding of the molecular defects, cancer remains a major cause of mortality and morbidity worldwide. In the surgical treatment areas, precise positioning of the tumor and the area of the incision are critical factors. In this respect, the biopsy of sentinel lymph nodes, which are the first lymph node(s) to receive the drainage from the primary tumor, is important in determining the spread of cancer as well as the staging of cancer . The sentinel lymph node biopsy (SLNB) was first used by the surgical oncologist Morton, who applied the technique to the surgery of cutaneous melanomas . In 1994, Giuliano et al. first performed SLNB in the breast cancer patients by using the blue dye, and the results showed an accuracy rate as high as 95 % . Around the same time, a radioisotope tracer was used in SLNB by Alex and Krag . Furthermore, many large clinical trials proved the feasibility and accuracy of evaluating the status of axillary lymph nodes by using SLNB in breast cancers [6, 7, 8]. Besides breast cancers, SLNB is also used in the surgical treatment of other malignant cancers such as head and neck, gastrointestinal, and gynecological carcinomas. The traditional tracers for SLNB mainly include the blue dye, nuclein, and nanocarbon. However, use of these tracers in SLNB is time-consuming, and the experience of the surgeons also affects the detection rate and accuracy. Since the lack of real-time monitoring may lead to tissue injuries, some researchers applied the optical molecular imaging technique in SLNB . With the advantages of simplicity in operation, noninvasiveness, real-time capability, high sensitivity, and cost effectiveness, optical molecular imaging is widely used in life sciences. In the clinical arena, optical molecular imaging is applied to diagnose very early-stage carcinomas. In 2010, Roger Tsien introduced the innovative fluorescence microscope imaging technology for intraoperative tumor visualization and precise excision . Clinically, an appropriate tracer and a surgical navigation system are the important components of the optical molecular imaging technology. Because of their deep penetrating capacity and minimal absorbing ability in the tissues, the near-infrared light with wavelengths from 650~900 nm is known as tissue optical window. Compared with the visible light, the near-infrared light has the advantages of low scattering in the tissue absorbance, less auto-fluorescence, and high signal-to-background ratio. As one of the near-infrared fluorescent dyes, indocyanine green (ICG)  is low molecular weight, nontoxic, and quickly cleared by the hepatic route. With the absorption wavelength at 765 nm, the emission wavelength at 840 nm, and a high signal-to-background ratio, ICG is used in SLNB and is approved by the FDA (Food and Drug Administration) and EMA (European Medicines Agency) . Portable optical molecular imaging operation-guided systems. PDE™ is an imaging equipment produced by the BinSong Photon Industry in Japan and looks like a flashlight. Another headset system with the advantage of keeping the surgeons’ hands free was developed by the University of Washington . Functional optical molecular imaging surgery-guided systems. Three cameras were used to collect the images in real time by the FLARE™ Imaging System developed by the Harvard University . Two of the cameras were used to collect the near-infrared fluorescence signal, while the other one collected the visual light signal for image infusion. Currently, FLARE™ and miniFLARE™ serve in the treatment of some malignant tumors, especially in SLNB. Another multi-spectral system developed by the Technical University Munich, Germany, also had been used in ovarian cancers . The molecular image-guided surgery system GXMA Navigator developed by Chinese Academy of Sciences has been used in the SLNB in breast cancers and gastric cancers . The endoscopic optical molecular image-guided surgery system. 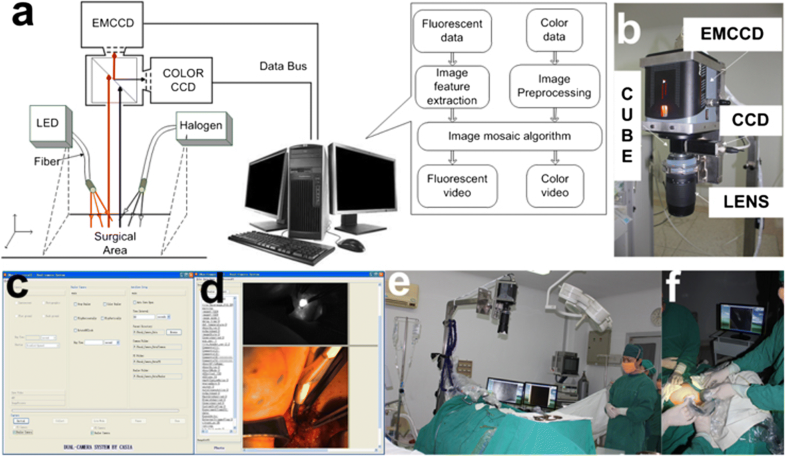 In the dark environment in the coelom, surgeons can gain a high signal-to-background ratio through the endoscopic optical molecular imaging-guided surgery systems. Glatz  developed a laparoscopy system in which images were fused by the color and near-infrared fluorescence to position precisely the borders of colorectal tumors. In this article, we have mainly discussed the application of the near-infrared fluorescence staining with ICG for the detection of sentinel lymph nodes in breast cancers and other malignant cancers such as head and neck cancers, gastrointestinal, and gynecological carcinomas (Figs. 1 and 2). Schematic diagram of the surgical navigation system and its application in surgery. a The principle figure of the surgical navigation system clarifying the operation course of the system. When the LED light illuminated the surgical area, the ICG dye emitted NIR light. The emission and reflection of the halogen light went through the lens to the prism. Then, the light was equally divided into two beams by the prism. One beam went through the filter to the color CCD and the other to the EMCCD. All of the data collected from the CCD were transferred to the computer, and the computer controlled the CCD. b The hardware of the surgical navigation system. c User interface of the software offering exposure time and auto capture interval time parameter settings. d Image acquisition interface as an example of the capture mode results. e Preoperative preparation in the operating room. f Intraoperative diagnosis with a surgical navigation system carried out during the surgery . Laparoscopic observation around the left gastric vessels. Lymph vessels and LN can be easily detected by IREE with indocyanine green (ICG). a Ordinary light observation of lymph vessels around the left gastric artery. b Infrared ray observation of lymph vessels around left gastric region (lymph vessels (arrow); ICG positive node (arrowhead)). c Ordinary light observation of lymph vessels around the right epigastric artery. d Infrared ray observation around the right epigastric artery shows first drainage lymph vessels, and sentinel lymph node (SLN) (arrow). e Ordinary light observation of lymph vessels. f Infrared ray observation of lymph vessels (first drainage lymph vessels (arrow); SLN (arrowhead)) . ICG was first used as a tracer for SLNB in 18 breast cancer patients in 2005 by Kitai et al. . The lymph vessels were visible during the operation, and the SLNs were detected in 17 breast cancer patients with a detection rate of 94.4 % (17/18). Subsequently, other research centers performed the same procedure in small studies. In 2008, Ogasawara et al. utilized ICG as a tracer for SLNB in 37 breast cancer patients, and the detection rate was about 72.9 % (27/37). Similarly, Murawa et al. used ICG in 30 breast cancer patients and detected SLNs in 97 % (29/30) of patients with the false-negative rate of 9.5 % (2/21). The results of Hirche’s group showed the detection rate of 97.7 % (42/43) for SLNB of breast cancer patients using ICG, and the false-negative rate was 5.6 % (1/18) . With the advances in the fluorescence imaging-guided systems, both the images and technical operation have improved benefiting the surgeons in detecting the SLNs. A large number of patients were enrolled by many research centers for SLNB studies. In 2010, 142 breast cancer patients were enrolled by Hojo’s group  showing a detection rate of 99.3 % (140/142) in SLNs by using ICG, and the average number of nodes detected was about 3.8. Using a combined effort of three research centers , Sugie et al. reported a detection rate of 99 % (408/411) in 411 patents and the average number of nodes detected was about 2.3. The metastatic lymph nodes were detected in 39 breast cancer patients, with 100 % sensitivity. As shown in Table 1, since 2010, ICG was applied to SLN detection in breast cancer patients in over 40 studies and the detection rates were almost over 95 % [22, 25, 26, 27, 28, 29, 30]. Some investigators compared the detection rates between ICG, blue dye, and nuclein and noticed the better performance of ICG compared with the blue dye and nuclein. Sugie et al., together with three research centers, reported that the detection rate of SLN with blue dye was about 83–93 %, while it was up to 99.3 % with ICG . Samorani’s group showed that the detection rates with ICG and nuclein in SLN of 301 patients were 98.7 and 95.3 %, respectively . However, Sugie et al. reported comparable detection rates of 97.2 and 97.0 % with ICG and nuclein, respectively, in 821 patients . Some investigators analyzed the false-negative rate of ICG in SLNB and found it to be lower than 10 % [22, 24, 26, 27, 28, 30, 31, 32, 33]. A meta-analysis of six studies, which used ICG as a tracer in SLNB of breast cancer patients, reported the sensitivity of about 92 % (85 %–96 %) and the specificity of about 100 % (97 %–100 %) . When ICG was used with the blue dye or nuclein, the false-negative rate was decreased. With 86 enrolled patients, Guo and coworkers compared the false-negative rate between ICG and ICG with blue dye in 86 patients and showed 12 % false-negative rate in the ICG group, while it was as low as 4 % when the ICG was combined with blue dye . Another study by Meng and colleagues also supported higher sensitivity and lower false-negative rate with ICG plus blue dye. The false-negative rate was 11.1 % with ICG alone and 3.4 % with ICG plus blue dye . The average number of SLNs detected with ICG ranged from 1.75 to 3.8 [21, 22, 23, 24, 25, 27, 29, 30, 35]. Murawa et al. reported the average number of detected SLNs to be 1.75, whereas  with the application of ICG, Hojo and colleagues detected an average number of 3.8 SLNs indicating the benefit of advance technology in improving SLNBs . The largest study of SLNB in breast cancer patients so far was of 821 patients in which Sugie’s group found the detection rate of 97.2 % and the average number of SLNs detected was 2.3 in the ICG group, while the detection rate was 97 % and average SLNs detection number was 1.7 in the nuclein group . The detection rate increased to 99.8 % by combining ICG with nuclein. Also, 180 cases had lymph node metastasis, and the false-negative rate decreased to 2.8 % by combining ICG with nuclein which was lower than the 9.6 % false-negative rate in a previous study that used nuclein and blue dye . As for the safety profile of ICG, occurrence of allergic reactions was reported in 0.34 %, and severe side effects were rare occurring in 0.05 % cases. Also, the incidence of side effects was related to the dosage of ICG and increased when the dosage exceeded 0.5 mg/kg. However, in clinical practice, the dosage used is much less than 0.5 mg/kg . Furthermore, the clinical follow-up data showed low recurrence rates of axillary nodes in patients receiving ICG. In two studies of 43 patients with a median follow-up of 4.7 years by Hirche et al. and of 168 patients with a median follow-up of 30.5 months by Toh et al. , no lymph node recurrence was observed. In another study by Inoue  and colleagues, enrolling 711 patients with a median follow-up of 38 months (from 4.4 to 87.7 months), only 2 cases (0.4 %) had lymph node recurrence. In 2002, Kitagawa et al. used a combined method of dye and radioisotope as a tracer in SLNB which was effective for accurate SNL sampling in early-stage gastric cancers . The first study to determine the feasibility of SLNB guided by ICG fluorescence imaging in gastrointestinal caners was performed by Kusano et al. in 2008 . In 26 colorectal and 22 gastric cancer patients, the SLNs and lymphatic vessels of the tumor could be visualized by fluorescence imaging when the ICG solution was injected subserosa around the tumors. In gastric cancer and colorectal cancer patients, the SN detection rates of 90.0 and 88.5 % and mean number of SNs of 3.6 ± 4.5 and 2.6 ± 2.4, respectively, were detected. Furthermore, gastric cancer patients with T1 stage disease had the accuracy and false-negative rates of 88.9 and 33.3 %, respectively, while 100 % accuracy and 0 % false-negative rate were observed in T1 stage colorectal cancers. 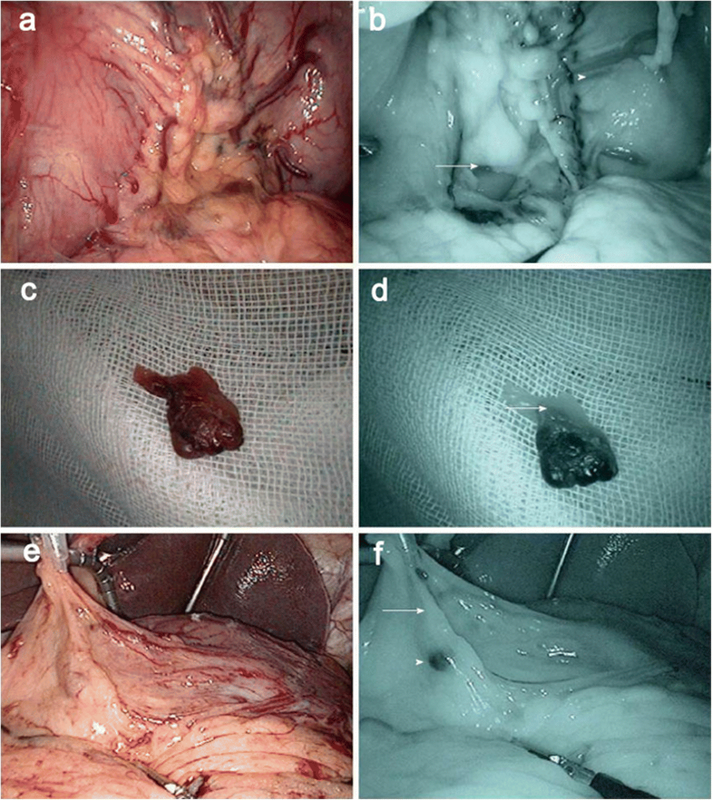 Thus, the results showed that ICG fluorescence imaging allowed easy, sensitive, and real-time imaging-guided SLNB in patients with gastric and colorectal cancers and should be further explored. SLNB guided by ICG fluorescence imaging was also used in laparoscopic surgeries for gastric cancers. In 2010, Tajima et al. used this procedure effectively in patients with cT1 or cT2 stage gastric cancers . Either laparoscopic-assisted gastrectomy (LAG) or open gastrectomy (OG) was performed on 38 and 39 patients with T1 or T2 stage cancers, respectively, by using ICG fluorescence imaging. The detection rate and mean number of fluorescence nodes were reported to be 94.7 % and 7.9 in the LAG group and 94.9 % and 7.2 in the OG group, while the accuracy and false-negative rate were 97.25 and 25.0 % in the LAG group and 91.9 and 23.1 % in the OG group. Emile et al. performed a meta-analysis on 12 studies including 248 patients and concluded that the median sensitivity, specificity, and accuracy of detection of colonic cancer SLN by ICG were 73.7, 100, and 75.7 %, respectively . By using SLNB in gynecological carcinoma, complications of a complete lymphadenectomy, especially the rate of lymphedema, could be decreased . Several researchers compared ICG, blue dye, and [99mTc]colloid in SLNBs of gynecological carcinomas. In 2016, Buda et al. performed a study in women with stage I endometrial or cervical cancers to compare the detection rate and optimal bilateral mapping by using ICG versus [99mTc]colloid plus blue dye, or the blue dye alone. The detection rate of ICG was 100 % and higher than those of [99mTc]colloid with blue dye or blue dye alone which were 97 and 89 %, respectively. The bilateral optimal mapping rate for ICG was also higher than that of [99mTc]colloid with blue dye or blue dye alone . Moreover, Buda et al. reported that patients with cervical or endometrial cancers, who underwent SLNB with ICG, received a better quality of care compared with those with [99mTc]colloid or blue dye as assessed by the European Organization for Research and Treatment of Cancer . The same investigators also described that using the laparoscopic procedure for cervical cancers, the detection rate and bilateral optimal mapping with ICG fluorescence mapping were significantly higher than that with 99mTc-colloid and blue dye . SLNB has been used in oropharyngeal cancers, head and neck cutaneous melanoma, and nasopharyngeal cancers and has been shown to remarkably decrease the complications of the neck dissection providing a more accurate node staging of the carcinomas . In 2010, Bredell et al. used ICG fluorescence to detect SLNs in patients with N0 oropharyngeal cancers . ICG was injected around the tumor, and SLNs were detected using an infrared video camera on the neck area. As reported by Hayashi et al. in 2012, this technique avoided a shine-through phenomenon observed during the surgery with other techniques such as lymphoscintigraphy, patent-blue staining, and gamma probes . In 2015, Chan et al. used ICG for SLNB mapping in five patients with recurrent nasopharyngeal cancers who had previously undergone radiotherapy and injected ICG around the tumor for real-time mapping during the surgery . Nine sentinel lymph nodes were detected, and SLN metastasis was confirmed by pathology in three patients. Many investigators have reported better results for detecting SLNs with the combination of ICG with 99mTc-colloid compared with ICG alone [51, 52]. The research using ICG for SLNB in other malignancies mentioned above is summarized in Table 2. To ensure the location of metastatic carcinomas and aid in surgical resection. The feasibility of applying optical molecular imaging in clinical settings was demonstrated in 2011 by Van Dam et al., who applied the FITC-labeled folic acid probe to confirm the location and the extent of metastasis in ovarian cancer patients and to excise the tumor precisely . To confirm the margins of malignant carcinomas. In 2015, Ueo and colleagues developed the γ-glutamyl hydroxymethyl rhodamine green probe, which, when combined with GGT, could generate the green fluorescence highly beneficial for accurate incision of margins in patients undergoing breast-conserving surgery . To protect nerve functions, when the fluorescence-labeled phage polypeptide was injected into mice, the peripheral nerves could be visualized in 2 h, and the effect lasted for as long as 8 h . With this probe, surgeons can benefit in repairing the injured nerves or preventing nerve injury during the operation. This technique is successfully being applied in clinical settings . In addition, targeted multimodal molecular imaging probes have grabbed increasing attention. In the basic research of malignant tumors such as breast cancer, liver cancer, and gastric cancer, multimodal molecular imaging probes combined with ICG have been gradually developed and applied. By taking advantage of the near-infrared light absorption property of indocyanine green, Zheng et al. developed an ICG-PLPEG nano-multifunctional probe targeting folate and studied it in mouse breast cancer cell lines. They found that the probe has a strong absorption of laser energy in the near-infrared region and can specifically kill cells that express high levels of folate and confirmed the target ability of the probe and its usage in photoacoustic therapy. Ito et al. developed a multimodal imaging probe combining magnetic resonance imaging (MRI) and near-infrared fluorophore-labeled EGFR or CEA antibodies. With the probes, they sensitively detected metastases of gastric cancer cells < 1 mm in diameter in peritoneum of mice. Chen et al. synthesized the bimodal probe, conjugating superparamagnetic iron oxide (SPIO) nanoparticles, tumor-targeted agent Arg-Gly-Asp peptides (RGD) and near-infrared fluorophore dye-ICG, and performed study in rat liver cancer models. The results showed that the probe can clearly locate the tumor for accurate tumor resection. Guan et al. fabricated ICG-loaded gold nanorod@liposome core-shell nanoparticles (Au@liposome-ICG) as a probe to detect mouse liver cancer. The probe exhibits excellent biocompatibility, high stability, and strong imaging signal, and can effectively perform tumor detection and guide tumor resection. Functional multimodal molecular imaging probes combining with ICG are also applied in SLNB. By combining ICG with [99mTc]labeled nano-colloid, Brouwer et al. formulated a heterocomplex tracer with both fluorescence and radioactive functions for SLNB . Ting and colleagues used F-18 labeled near-infrared fluorescence in SLNB to get precise images and position of lymph nodes for the excision of SLNs . The optical molecular imaging technique has developed rapidly in the past 10 years and has been tremendously useful in the treatment of malignant carcinomas. The near-infrared fluorescence imaging with ICG for the SLNB in breast cancers, head and neck, gastrointestinal, and gynecological carcinomas has been extensively used. Compared with conventional methods, there is considerable improvement in the detection rate and accuracy. Raising the detection rate will help to reduce lymph node dissection caused by SLNB failure, thereby reducing postoperative complications. Increasing the accuracy rate is even more important for long-term treatment outcomes and helps reduce the risk of postoperative recurrence. Nevertheless, this technique still has many shortcomings: There is no standard concentration of ICG; neither are there specified steps during the procedure. Also, tracing requires special devices, but the properties of the hardware and software of the devices are different which may affect the image and accuracy. Furthermore, the number of the sentinel lymph nodes detected by the ICG method is more than those detected by conventional methods posing a risk of detecting some non-sentinel lymph nodes. At present, clinical studies about the detection of SLN by ICG are mostly focused on the detection rate, accuracy, and detecting number by comparing ICG and other tracers. However, long-term follow-up data is rare and the impact on treatment outcomes remains to be determined . In conclusion, a standard operation method and further optimization of the imaging system would be the important steps in advancing optical molecular imaging. The use of multiple probes, which can position the sentinel lymph nodes more precisely and detect metastatic status in real time, is another area that requires focused efforts. 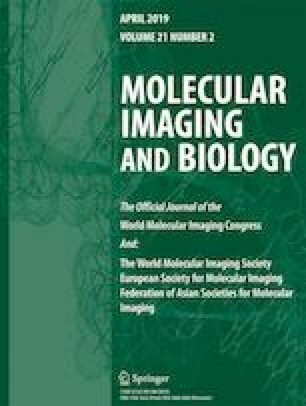 With the improvement in the sensitivity of the probes and verification in large clinical trials, the technique of optical molecular imaging is expected to play an increasingly important role in the treatment of malignant carcinomas. The authors sincerely thank all participants for their lively discussion during the study group meeting. This work was supported by grants from Major International Collaborative Research Project of Natural Science Foundation Committee (81320108015), Research Team Project of Natural Science Foundation of Guangdong Province (2016A030312008), and start-up fund from Xiamen University.